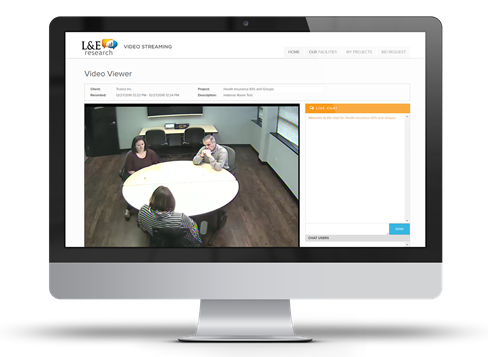 Use L&E HD Video Streaming to observe your focus groups in real-time or anytime you want, from anywhere you want. L&E HD Video Streaming is integrated with the L&E Client Portal, making it simple to access and navigate. Integrated chat functionality allows you to communicate with your team members in real-time. And the robust video editing tools are fine-tuned for market research, with video markers and highlighting features that allow you to easily pinpoint significant moments in your research. With L&E HD Video Streaming, you get all of the features of other streaming products, but at a fraction of the cost. In addition you can utilize our partnership with LivingLens and take any of your content from L&E and import it into the LivingLens platform to uncover new insights through their video analytics techology. L&E Video Streaming is now available* in high-definition, giving remote viewers an even clearer and more detailed picture of respondents facial expressions and reactions, even when you can't be onsite for your groups. *HD Video Streaming is available on request. Please ask your Client Relationship Manager or Project Manager if you would like to utilize HD video streaming.